Roland adds to its catalog the new E-A7 61-note arranger keyboard, which offers over 1,500 voices and many quick access controls for live use. 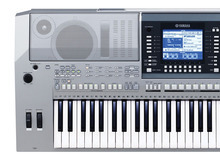 Yamaha introduces at Summer NAMM in Nashville three arranger keyboards in the new PSR-S series. Korg announces the availability of a new 88-key arranger keyboard equipped with a touch screen, the HAVIAN-30. The Yamaha PSR Series welcomes the new PSR-F50 model for beginners and entry-level budgets. Sampling is also on the menu of the new PA3X Le professional arranger keyboard that Korg introduces today. Casio completes two of its series of arranger keyboards with the CTK-2400, LK-170, LK-175 and LK-260, which are introduced at Summer NAMM. The Yamaha PSR arranger keyboard series welcomes in 2014 the E443 little brother, which has been unveiled at Musikmesse in Frankfurt. Korg unveiled at Musikmesse 2014 the new member in the Pa arranger keyboard family. Meet the Pa300. Following the 20+ videos posted yesterday, Yamaha now announces the detail of the new version of its Tyros arranger keyboard.